Tomakomai is the fifth largest city on the island of Hokkaido, and a major port and energy resource for northern Japan. The area is highly industrialized with newly constructed CO2 capture and injection facilities, providing an excellent opportunity for the GCCC to partner with Japan CCS Co., Ltd. on monitoring the site’s progress. The HR3D survey was planned with cooperation from Japan CCS Co., Ltd. (JCCS) and the Japan Ministry of Economy, Trade and Industry (METI), and implemented as a collaboration between JGI, Inc. (JGI) and the Gulf Coast Carbon Center (GCCC; The University of Texas at Austin) as a part of the cooperative projects on CCS technologies, based on the Memorandum of Cooperation signed on April 27, 2015 between US Department of Energy (DOE) and METI. JCCS submitted the seismic survey permission application and carried out the survey communication to Tomakomai Federation of Fisheries Cooperative Associations and others prior to acquisition. JGI and GCCC appreciate METI and JCCS for allowing for the opportunity to collect HR3D data at the Tomakomai CCS monitoring site. CO2 injection began at Tomakomai on April 6, 2016. The project is injecting at a rate of approximately 100,000 tonnes of CO2 per year captured from a hydrogen production facility at an oil refinery plant. The CO2 is injected into a sandstone reservoir at about 1100 m depth. To date, more than 200,000 tonnes of CO2 have been injected. In order to advance monitoring at the site and test novel technologies, GCCC researchers have collaborated with Japanese CCS experts for a two-way transfer of skill. The goal of GCCC’s work in the area is broadly to validate monitoring, verification, and assessment (MVA) technologies in offshore settings, and more particularly to acquire and validate a UHR3D seismic dataset at operational CCS field demonstration project; validate untested dynamic acoustic positioning techniques (SBL); and define CO2 plume boundaries as an environmental monitoring task. Initial processed volume and interpretation of the HR3D seismic. Figure record length in B is 600 msec TWTT, or approximately 550 m depth below sea surface. Upper map is for the very shallow surface at 47 milliseconds two-way travel time. The UHR3D seismic acquisition geometry. Image courtesy of JGI. UHR3D system in operation during active acquisition of seismic data. Foreground: pneumatic source assembly in the water tethered by aft crane. Receiver tail buoys in the water visible at mid-distance. Background: shoreline facilities of Tomakomai, where CO2 injection wellheads are located but not visible. 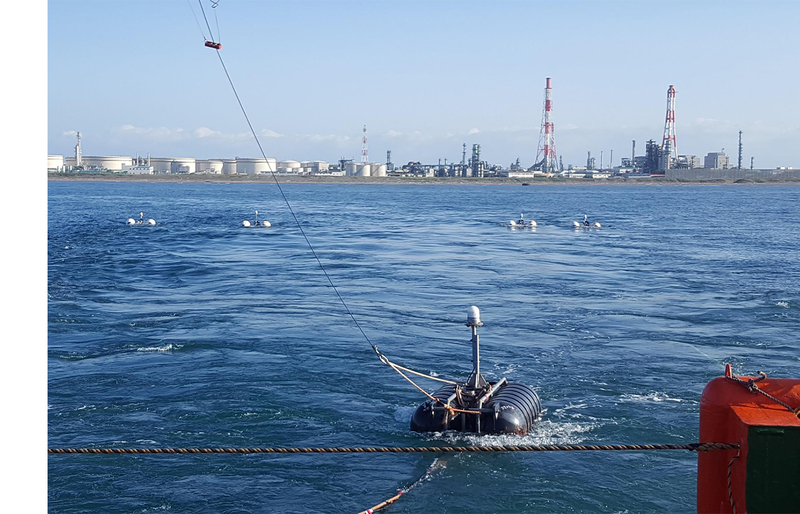 The Tomakomai project site provided an ideal background to test an emerging technology that could benefit CCS monitoring substantially: Ultra-high-resolution three-dimensional subsurface imaging, or UHR3D. UHR3D technology allows the subsurface to be imaged in unprecedented three-dimensional (3D) resolution using a high frequency acoustic source, high sample rate, and closely spaced short-offset streamers, resulting in small data bin size. Typically the upper kilometer of stratigraphy can be assessed, depending on source characteristics. UHR3D technology fits into the larger network of monitoring protocols and technologies already deployed at this site, including instrumented deep observation wells, a permanent 2D seismic seafloor cable, and a network of seismometers on the sea floor. The Moebetsu Formation is ideal for testing UHR3D technology due to its depth and relatively high porosity and low seismic velocity. Seismic energy can detect changes in pore fluids, such as the replacement of salty brine water with carbon dioxide. When the rocks are saturated with CO2 after an injection, the velocity of the seismic waves slow down further, creating an identifiable signal. UHR3D fills a unique niche in offshore imaging. 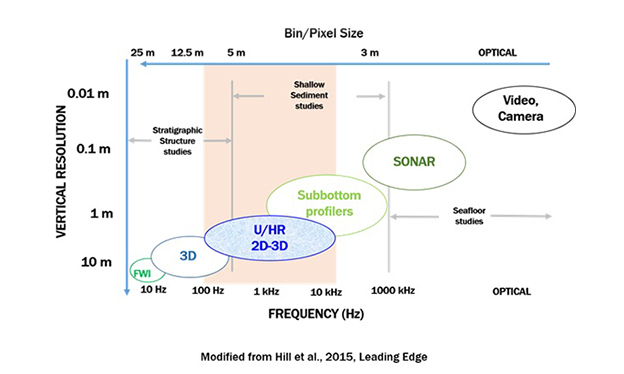 The frequency emitted (1kHz) optimizes the trade-off between low resolution, but deep subsurface imaging provided by 3D or subbottom profilers and higher resolution imaging of targets close to the source like SONAR or video. UHR3D—near the middle of the frequency range—is best for shallow sediment imagining, which is ideal for monitoring the overburden in CCS projects. 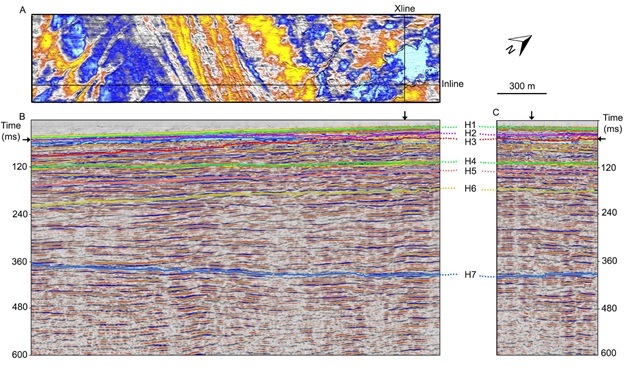 Lower resolution 3D seismic is often cheaper and easy to deploy over a wide area during initial subsurface characterization (especially for deep targets), but once a suitable area is identified for injection, the higher-resolution UHR3D imaging can be deployed above the reservoir where refinement is needed, particularly above the CO2 injection location. 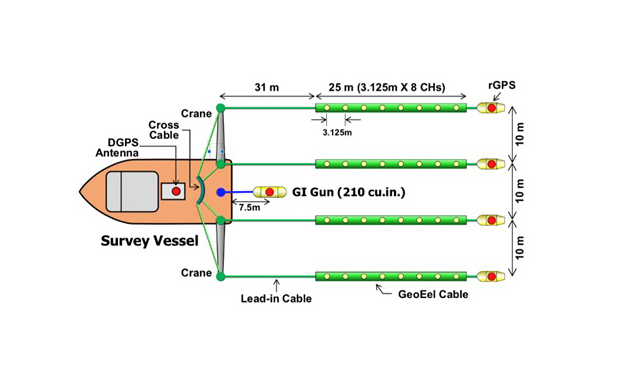 For UHR3D data to be collected, short, multi-channel solid-core streamers are towed behind a vessel at approximately three meters below the ocean surface. The high-frequency source signals (compressed air source) are triggered every five seconds (or approximately 10-15 meters separation), Using real-time GPS locations, each shot and acoustic recording is then combined to create a three-dimensional image of the subsurface stratigraphy. For this project, seismic equipment was shipped from the Gulf Coast Carbon Center in Texas to Tomakomai, Japan. There are several different offshore imaging technologies--all with different frequency ranges to optimize resolution of the subject being imaged, whether it's below the seafloor or above. The UHR3D seismic acquisition survey for the Tomakomai project took place between August 16 and 29, 2017, with six days of operations at sea. Preliminary key findings of the CO2 sensitivity of UHR3D suggest that this technology is an excellent tool for overburden monitoring at CCS projects. The next step will be to consider possibilities for improving positioning using previously untested underwater dynamic acoustic positioning techniques with short baseline acoustic (SBL) technology. A second HR3D survey is planned for late 2019. This study was funded and managed by the U.S. DOE/NETL, under award number DE-FE0028193. This study supports SubTERpillar 4 (new subsurface signals) and advances the long-term Carbon Storage program goal of developing technologies to ensure 99 percent storage permanence.